Controlled Dissonance – What Have We Done To Number Nine? 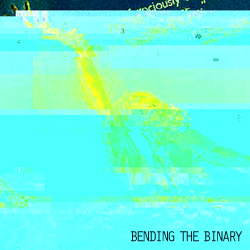 Bending The Binary – A compilation of music whose creation utilizes databending techniques. Databending – or altering raw data to produce sound or influence the interpretation of existing sound files – is a vast territory of sound design that can be implemented in a multitude of ways, each providing its own unique result. Bending The Binary is a free compilation devoted to illustrating some of these results. Many different techniques were employed in the creation of this compilation. Here are some of the artists explanations of their own techniques. “To do this track I used a technique that I have used before in noise pieces. I had previously converted picture files to raw wave (music) data but this time decided to download the homepage of the Intelligent Machinery website and use that. This data was imported into Sound Forge as a “raw” file then saved as a conventional windows “wav” soundfile. I stretched the file to make it a little longer and also to give it a grainy and less harsh sound. I then made three copies. One was tuned down an octave while the other two were tuned up one and two octaves respectively. The first one was kept at its original tuning. Two of the samples were stretched again and effects were added to these two files. All start and end points were then edited to make sure they looped without glitches. All four samples were then loaded into my phrase sampler. 9. go through all the audio files and select the parts you like and make loops. 10. put loops into Live, use time stretching, granular delay, filters and reverb. 11. mix live and record.